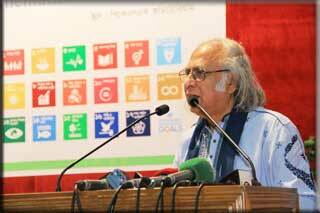 To help Government achieve the UN-sponsored Sustainable Development Goals (SDGs) by 2030, Palli Karma-Sahayak Foundation (PKSF) has launched a new platform titled “People’s Voice: Strengthening SDGs Implementation in Bangladesh”, consisting of sector-related organisations and professionals. Honorable Planning Minister Mr AHM Mustafa Kamal, MP, inaugurated the platform at a launching seminar held at the PKSF Auditorium, Dhaka on 19 February 2017. PKSF Chairman Dr Qazi Kholiquzzaman Ahmad chaired the event, in which the Foundation’s Managing Director Md Abdul Karim gave the welcome address. 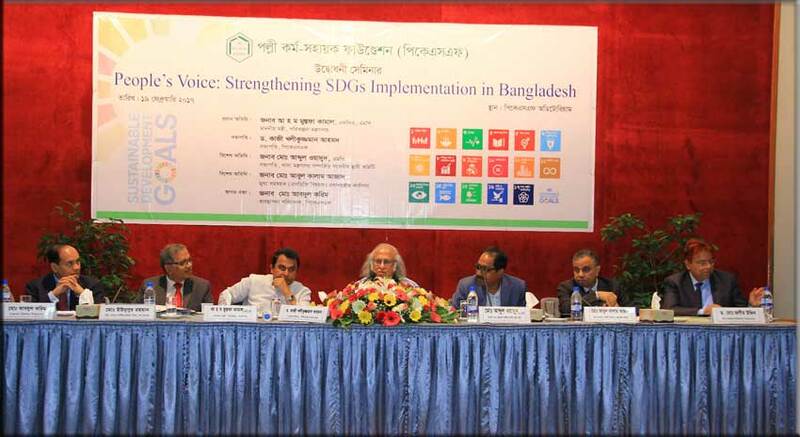 Dr Md Jashim Uddin, Deputy Managing Director (Admin), gave a presentation on how the PKSF activities have been contributing to the endeavors of the Government in SDGs implementation. Parliamentarian Mr Md Abdul Wadud, also the Chairman of the Parliamentary Standing Committee on Food Ministry; Mr Md Abul Kalam Azad, Chief Coordinator for SDGs affairs in the Prime Minister’s Office; and Mr Md Eunusur Rahman, Secretary to the Bank and Financial Institution Division, the Finance Ministry, attended the programme as special guests. 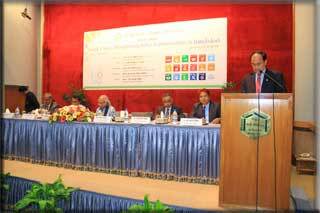 They emphasized that Bangladesh, following the remarkable progress in achieving MDGs, has the capacity to achieve SDGs before the due time by mobilizing and utilizing internal resources. The Government officials, the officials of PKSF and its Partner Organizations (POs), development agencies and other stakeholders attended and took part in the discussion of the seminar.